Another week and another marquee game for the Blue Valley Tigers. That is something that Kansas high school football fans need to get used to. Aside from the brutal Eastern Kansas League schedule, Eric Driskell’s team plays a non-league game at top-ranked Salina South next week. But first, the 2012 5A state runners-up Bishop Miege comes calling on Thursday night. 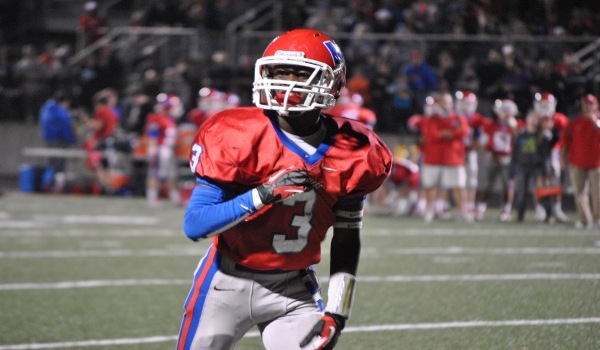 Miege opened their season with a 46-3 pasting of Blue Valley North last week. New Stag quarterback Ryan Willis threw for 311 yards and three touchdowns. Willis, a junior who transferred from Olathe East, has already received an offer from Kansas State. Standout wide receiver McKinley Johnson caught five passes for 144 yards and two touchdowns for Miege. Meanwhile, Blue Valley took advantage of a pair of Gardner-Edgerton turnovers and rode its defense to a 28-0 shutout of the Trailblazers. The Tigers held Gardner-Edgerton running back Traevohn Wrench to 75 yards on 22 carries. Thirty-three of Wrench’s yards came on one carry. Wrench has only been able to manage 104 yards rushing on 45 carries against the Tigers the past two seasons. On offense, Tiger quarterback Logan Brettell connected on two touchdown passes with Mikey Henson and Chance Nelson added 132 yards and a pair of touchdown runs in the win. Blue Valley won this matchup 28-12 last season and the Tigers could very well ride the strength of their offensive line to another win over the Stags. Another Eastern Kansas League showdown as Blue Valley West visits St. Thomas Aquinas in a match of the league’s two top teams from last season. The Jaguars and Saints will attempt to play another classic like last season’s 38-35, three-overtime win by Aquinas. In last year’s game, Blue Valley West scored two late touchdowns to force overtime and the scoring continued in the first two overtime series as the two teams traded touchdowns. In the third overtime, Blue Valley West held the Saints to a Derek Rodgers field goal. Blue Valley West also lined up for a field goal to tie the game, but faked it and Aquinas stopped them short of the end zone to secure the win. The two teams started the 2013 season in different fashions. Blue Valley west dominated Washburn Rural 35-7 behind quarterback Ryan Ralston. The 6-foot-4, 220-pound senior threw for 118 yards and a pair of touchdowns to wideout Spencer Johannesman. Ralston also rushed for two more scores after running for 963 yards and 25 touchdowns last season. One key for the Jaguars this season was finding a replacement for all-state running back Conley Wilkins. They may have filled that void with Grant Garcia who rushed for 206 yards on 18 carries. Aquinas won the EKL title last season as part of a 10-2 season that ended with a state semifinal loss to Bishop Miege. The Saints return a solid nucleus again this season with ten total starters, but turnovers cost them in a 27-14 Week 1 loss to Blue Valley Northwest. Senior quarterback Danton Cosentino, who passed for 1,630 yards and 20 scores a year ago, threw for 196 yards against Northwest, but was intercepted three times. His top wide receiver, Ryan McNellis caught 7 passes for 108 yards and a touchdown. Joel Edwards rushed for 70 yards and a touchdown for the Saints. For Aquinas to avoid an 0-2 start, linebackers Cole Pickert (6-2, 220) and Joe Maxwell (6-0, 200) will have to slow down the Jaguar rushing attack. McPherson trailed El Dorado 7-0 at the half, but rallied for a 27-13 victory in a surprisingly close game. The contest was an eight-point game until the final 20 seconds. Junior quarterback Kyler Kinnamon completed 6 of 14 passes for 98 yards with a touchdown and an interception and the Bullpups rushed 40 times for 299 yards. Kinnamon collected 16 rushes for 184 yards and a TD, and senior Jose Gloria rushed 22 times for 109 yards and two scores. Kinnamon's TDs came on a 52-yard pass and a 70-yard run. McPherson had two turnovers and went 1 of 3 on extra points, but also picked off three passes. Hays snuck past Junction City 27-22 despite quarterback Alex Delton hurting his groin in the first quarter. Delton still completed 7 of 17 passes for 73 yards and had 13 carries for 22 yards with two total TDs and an interception. However, senior running backs Preston Weigel and Ty Whittington stepped up and helped HHS rush for 214 yards. HHS also took advantage of four Junction City turnovers and finished plus-2 in turnover margin. Last season, Hays won 58-28 in McPherson to snap a four-game winning streak in the series for the Bullpups. The contest will match two of Kansas' top coaches in Tom Young and Ryan Cornelsen and two of the best quarterbacks in Kinnamon and Delton. Hays also has an advantage in the kicking game with Lane Clark, a Division I-caliber leg who booted an 80-yard punt last Friday after a safety and kicked three extra points. If Delton can stay healthy, Hays High has a slight edge. Smith Center impressively opened the Darren Sasse era with a 34-13 victory against rival Norton. The Redmen rushed for 295 yards, including 19 carries and 142 yards and four rushing TDs from Grant Lambert. He also returned an interception 40 yards for another score. Senior quarterback Kody Molzahn took a big hit but remained in the game, threw for 53 yards and recovered a fumble. Up front, Jordan Shockley and Cole Lorenzen wreaked havoc for the Redmen. Beloit, last season's No. 1 scoring offense among 11-man programs with 744 points, rolled over Concordia, 48-0, in Week 1. The Trojans scored 16 points apiece in the first and second quarters and eight points in the third and fourth quarters. Payton Vetter, a four-year starter at quarterback, threw a 30-yard score to Bowe Behymer, and a 30-yard TD to Tanner Niemczyk in the first quarter. Behymer also rushed for a 55-yard score and returned a kickoff 65 yards and Vetter had TD runs of 35 and 30 yards. Last season, Beloit won 54-0. This is a more experienced Smith Center team, but Beloit is a complete unit. If the Madison Bulldogs are to stay atop the 8-Man, Division I rankings this season; they will have earned it. After winning on the road last week at 8-Man Division II’s top-ranked Baileyville B&B, the Bulldogs take on No. 3 Marais des Cygnes Valley in their home opener. Fred McClain’s Bulldogs trailed 16-6 at halftime at B&B last week, but rallied to take a 22-16 lead on a 50-yard touchdown run by quarterback Sage Blubaugh with under a minute to go in the game. B&B answered when quarterback Dustin Rottinghaus hit Blake Deters on a touchdown pass with 18 seconds left. The two 8-man powers went into overtime tied at 22. Baileyville B&B score first, but could not convert the two-point conversion. Blubaugh struck again on third down to tie the game at 28. Dallas Thompson kicked the PAT through and Madison celebrated a 29-28 win. This week they host Lyon County League rival Marais des Cygnes Valley which made quick work of Hartford in a 54-0 Week 1 win. The Trojans return 12 total starters from a team that finished 6-4 and lost in the first round of the state playoffs. The Trojans feature Matt Jones, a 6-foot-6, 225-pound tight end/linebacker that was featured on the cover of this year’s Kansas Pregame Magazine. Along with Jones, Marais des Cygnes Valley is loaded with experience on offense with seniors Kaden Vanderpool, Trey Irey, Caleb Dickey, and sophomore Christian Cannon. Vanderpool rushed for three touchdowns and returned a punt for another score. Dickey also returned a Jaguar punt for a touchdown as the Trojans put up 40 points in the first quarter. Marias des Cygnes will have to have a good performance from the guys up front in order to have success against Madison. Wallace County steamrolled over a solid Dighton team, 51-0, last Friday. The Wildcats have put an added emphasis on forcing turnovers this season and forced five against the Hornets, two interceptions by Kyle Gfeller and three fumble recoveries. Cayden Daily also returned a punt 55 yards for a TD early in the contest. Gfeller stepped in for quarterback Gavin Mote, a four-year starter, and completed 2 of 4 passes for 22 yards with a score and rushed 10 times for 56 yards and a pair of touchdowns. Hoxie opened with a 54-6 victory against Greeley County. Junior Connor Katt, last season's No. 2 running back, collected 16 carries for 164 yards and three TDs. Hoxie rushed for 254 yards and averaged 7.7 yards per carry. The Indians collected eight sacks, including 3.5 from junior Tyler Ewers. This is an early test for both teams that are strong on both sides of the ball, especially defensively. Hoxie is 20-9 since the start of the 2010 season, while Wallace County has made the playoffs all seven years under Kevin Ayers. The Wildcats are 19-3 in the last 22 games and have allowed just 11.9 points per game in that span. Friday's matchup will have two of the better center/nose guards in Wallace County's Dalton Walker and Hoxie's Mitchel Johnson. Wallace County defeated Hoxie 20-6 last season. The game turned on a 44-yard punt return by Wallace County that set up a score. Wallace County is very experienced one through eight on a senior-laden team and has a slight edge in some positions, especially defensively. Expect another low scoring game. Special teams and turnovers is likely the difference.